Wishing you all a groovy and far out Bicycle Day, in which the nation unites as one to commemorate the April 19th, 1943 date on which Swiss chemist Dr. Albert Hofmann intentionally tried out his newest invention, LSD, and then decided to ride his bicycle home. Holidays are fun. Hofmann’s first experiment with the drug had occurred days before, on April 16th. However, Bicycle Day’s founder, Professor Thomas B. Roberts and his co-celebrants chose this later date as, on the first 1985 observance, April 16th was a Tuesday, and Friday seemed like a better day on which to celebrate the occasion. 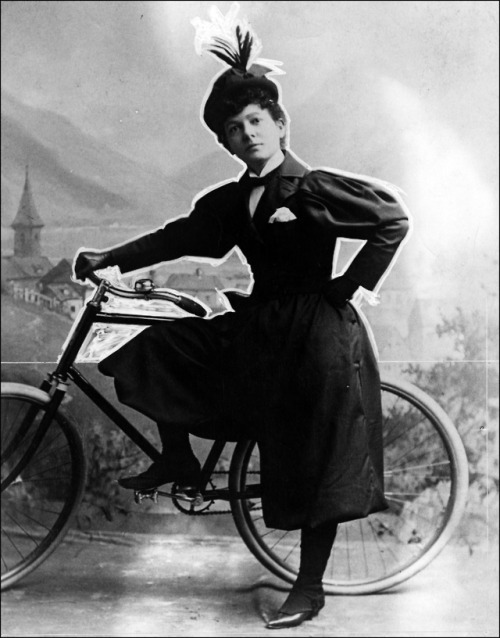 Actress Effie Essler (1855-1942), seen here in a daring black bicycle suit that dates to around the late 1890s or early 1900s, died in October 1942, and thus missed out on Hofmann’s discovery by about six months. I can only assume that’s why she looks so miffed. She had her bike ready to roll and everything.